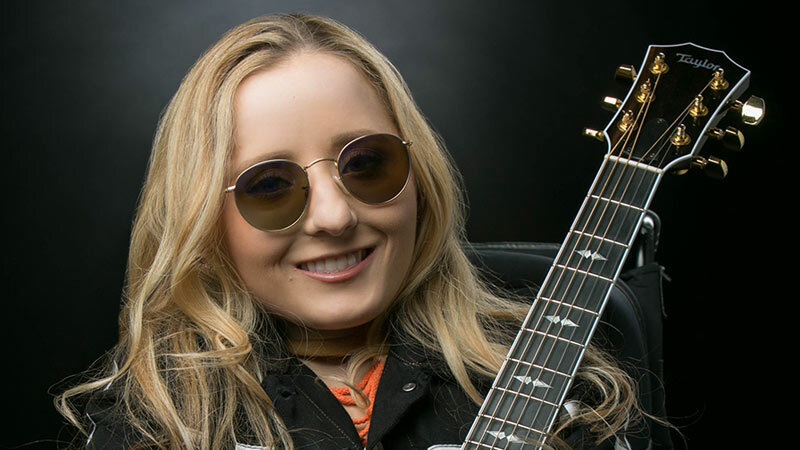 Wheeling singer/songwriter Ali McManus will perform her original music from her album, Unbreakable, and lead a sing-along. Her music video, Roll This Way, adapted from Aerosmith's Walk This Way, features rock star Steven Tyler. 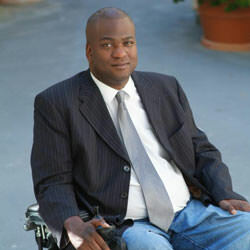 He's the star of the hit ABC television show, Speechless, and a long-time Abilities Expo attendee. 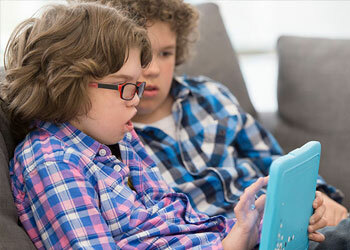 On Feb. 23 at 12:15 pm, Micah will talk with fans about his role as "JJ" on the groundbreaking sitcom, as well as his refusal to allow cerebral palsy to define him. 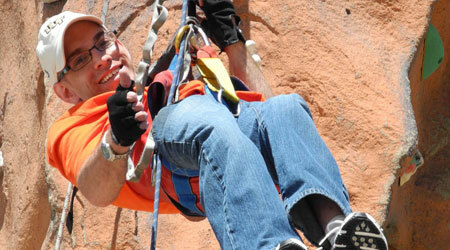 Scale "Mini El Capitan," our completely inclusive adaptive climbing wall! 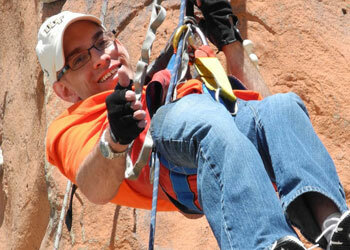 Using specially designed climbing equipment, Paralympian Mark Wellman will help attendees of all abilities reach the top. Sponsored by Liberator Medical Supply. Come see us at Booth #603 and test ride! 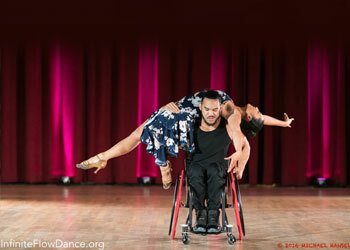 Join Margarita Elizondo and guest performer Gema Rodriguez of Dance Ability Tijuana, as they shares their love of dance. 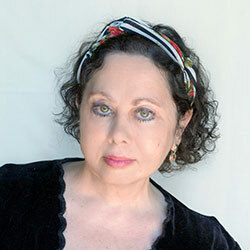 Margarita's tear jerking emotional storytelling style performances are sure to move you. 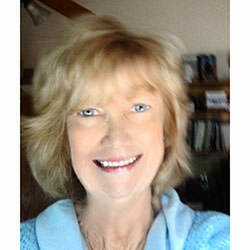 She has a special vision to prove that dance is therapeutic and anyone can dance regardless of age, experience, or ability. In our 30 minutes I will be presenting a quick "How To" approach to choreographing for dancers of all abilities. I have asked Cheryl Baxter of UCLA invite some of her dance students to participate in this event. This way we can emphasize the need for education as well as the boundless possibilities of working in this field. 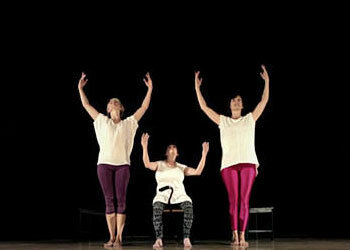 By using volunteers, the UCLA dancers and featuring Donna Russo I will create a short piece as the audience watches how the puzzle comes together. If time permits we will ask our audience members to contribute ideas and will implement them using our dancers. To end with some fun we will invite everyone to join us onstage for a "Follow Dance." #InfiniteInclusion is the concept that although we are all different … we can unite as one. 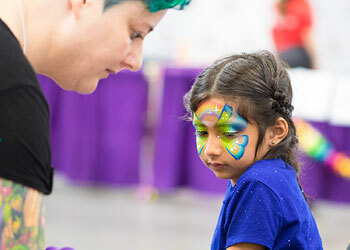 Join us for a short performance by Infinite Flow's professional dance troupe and Infinite Flow Kids, followed by a short interactive dance workshop and dance jam. Open to all abilities and all ages. Come out and dance! 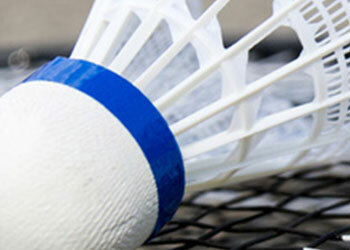 Badminton is for all abilities and you can test your skills at the Angel City Sport Zone. 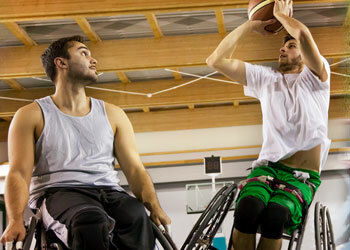 The sport is gaining popularity around the world and is one of the newest additional to the Paralympics. Join Angel City Sports for an interactive demonstration of boccia! Whether you are new to the game or have played before, you will have the opportunity to improve your skills and strategy. All ages and ability levels are welcome to participate in this demonstration. 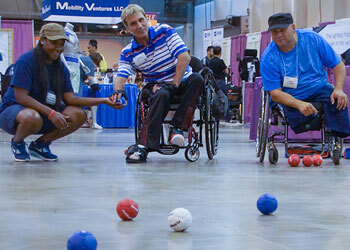 Boccia is the most inclusive adaptive sport as boccia balls are leather, and can be thrown or put in play with a ramp. Friends and families can also join in this fun-filled event! En garde! Stop by the Angel City Sports Zone and try this fast-moving game of tactics and techniques. 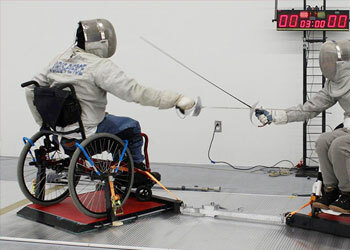 Fencers have complete freedom of the upper body, allowing them to lean, duck, turn, and lunge in their chairs. 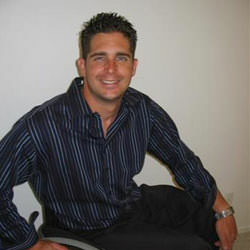 Just ask Paralympian Mario Rodriquez, who will be on hand to instruct. 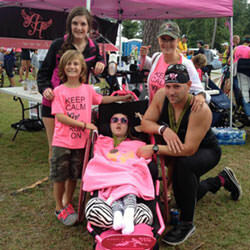 Test drive the Ainsley's Angels athletic ride-along experience! Created for anyone who would otherwise not be able to experience endurance events, Ainsley's Angels creates "Angel Teams" by pairing Athlete-riders with runners to compete in endurance events and road races. The Athlete rider is the core of the team and pulls the runner across the finish line with smiles, cheers and immeasurable inspirational spirit. Join Angel City Sports for an interactive sitting volleyball practice. Advanced players will introduce you to the specifics of the sitting game. You will learn fundamentals with fun techniques and competitive drills; grasping key concepts and rules of the game along the way. Paralympic Bronze Medalist Allison Compton will be in the building, eager to help you improve your game! Friends and families can also join in this exciting event! Ping pong, anyone? The Paralympic sport of table tennis will be in full swing at the Angel City Sports Zone so come and discover what could be your new favorite pastime. 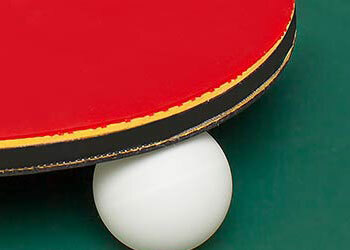 The typical table tennis rules are in effect with some slight modifications for wheelchair athletes. 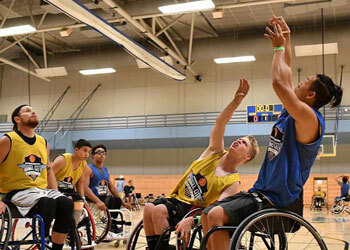 Stop by the Angel City Sport Zone for an interactive wheelchair basketball demo. Not only will you learn tips and techniques of the game, you'll get coached by wheelchair basketball Paralympian Megan Blunk. 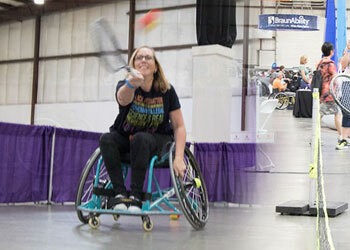 Join Angel City Sports for an interactive demonstration of the exciting sport of Wheelchair Tennis. Work on technique and receive tips from some stellar local coaches! All ages and ability levels are welcome to participate in this demonstration. Sports wheelchairs and tennis racquets will be provided. From 110 North, transition to the 10 West and exit immediately from the left lane to Pico Blvd. The Pico offramp becomes L.A. Live Way. Turn right into the West Hall parking garage. From 110 North, exit at 9th Street. Turn right on Flower Street, right on 11th Street and left on L.A. Live Way. Turn left into the West Hall parking garage. From 110 South, exit at Olympic Blvd. Turn left at bottom of ramp onto Blaine and left on 11th Street. Make an immediate right on L.A. Live Way and left into the West Hall garage. From 10 West, transition to the 110 North (Downtown) and exit at Pico Blvd. The Pico off-ramp becomes L.A. Live Way. Turn right into the West Hall parking garage. From 10 East, exit at Grand Ave. Turn left on Olive Street and left on Pico Blvd. Turn right on L.A. Live Way and right into the West Hall parking garage. From 10 East, transition to the 110 North and exit at 9th Street. Turn right on Flower Street, right on 11th Street and left on L.A. Live Way. Turn left into the West Hall parking garage. By Metrolink Rail: Take the Metro Red Line. Exit at 7th Street then transfer to the Metro Blue Line (Long Beach). Exit at Pico Boulevard Station. Then walk one block west to Figueroa Street. Take route 413 - From Temple/Hill (Civic Center) to 11th /Figueroa Street (LACC). Passenger drop-off/Parking: If your passenger requires an elevator, enter the gates of the West Hall Parking Garage of the LACC at the traffic light on Pico Blvd. between Figueroa Blvd. and L.A. Live Way. Turn right and proceed to the attendant who will direct your passenger to the elevator and you to parking. 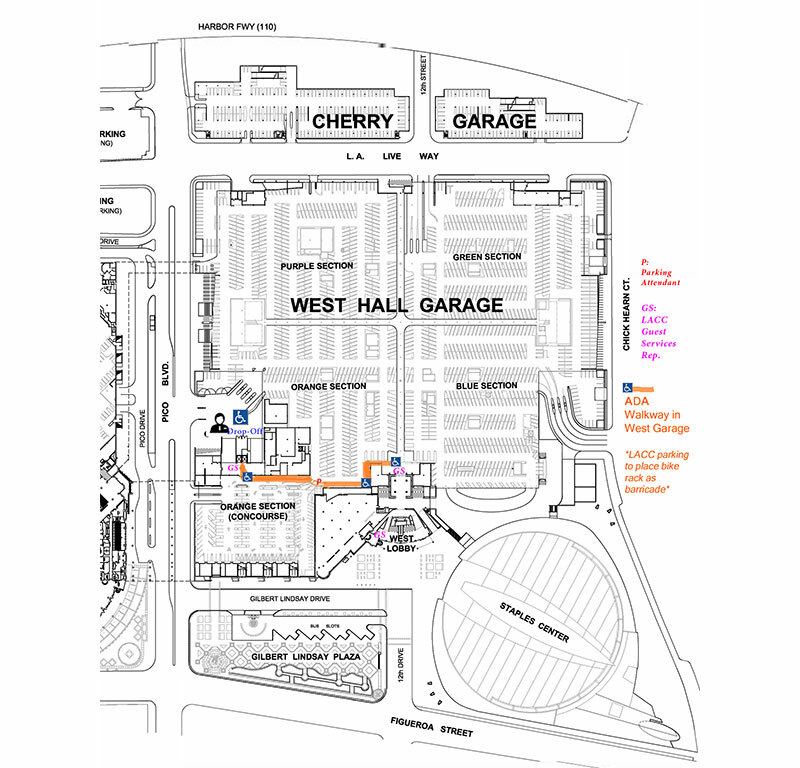 If you do not require an elevator, you may also enter the gates of the West Hall Parking Garage of the LACC from L.A. Live Way at the West 12th Street traffic light, which is between Chick Hearn Court and Pico Blvd. Proceed to the attendant who will direct your passenger to the drop-off location and you to parking. Parking at the LACC is $20/entry and subject to change. However, please note, that the Professional Bull Riding series will be at Staples on the 22nd and 23rd, which falls under special parking in West Hall Garage, meaning that starting at 4:30pm on those 2 days the rates will increase to $25. Currently, there is no special event Staples on the calendar for Sunday so parking rates will remain $20.00 throughout the day. If you will be driving a conversion van taller than 7', special parking arrangements have been made. Please drive to the loading dock ramp on L.A. Live Way for accessible parking. The LACC is not able to accept motor homes in their parking lot. The Los Angeles County Metropolitan Transportation Authority (Metro) is unique among the nation’s transportation agencies. It serves as transportation planner and coordinator, designer, builder and operator for one of the country’s largest, most populous counties. More than 9.6 million people – nearly one-third of California’s residents – live, work, and play within Metro’s 1,433-square-mile transportation service area. Besides operating over 2,200 peak-hour buses on an average weekday, Metro also designed, built and now operates 73.1 miles of Metro Rail service. The Metro Rail system consists of the Metro Red Line and Purple Line subways, and the Metro Blue, Green Line, and Gold Lines. In total, the Metro Rail system serves 70 rail stations stretching from Long Beach to downtown Los Angeles, Hollywood, Universal City and North Hollywood in the San Fernando Valley, from downtown Los Angeles to Pasadena and East Los Angeles, and Norwalk to El Segundo, and all points in between. 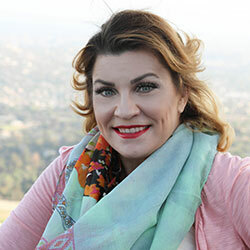 With 200 bus lines and five rail lines, Metro can take you just about anywhere in LA County. To get more detailed information, please turn on your computer and click on Metro.net, then “Rider’s Guide”. Attending the Abilities Expo using public transportation is easy and convenient. If you live near a Metro Rail line, you can take the rail to the Blue Line, exit at Pico Station and head west. Pico Station is one block from the LA Convention Center. Several Metro bus lines service the Convention Center: Express Lines 439 and 442, Rapid Line 730, and Local Lines 30, 31 and 81. Additionally, eight other transit agencies pick up and drop off near the Center. Proceed on accessible walkway that will take you near the Staples Center and to the West Hall A entrance, which is a straight shot from the 12th/Figueroa intersection. Metro's Reduced Fare Programs enable eligible applicants to obtain special TAP cards for reduced-rate fares and passes. 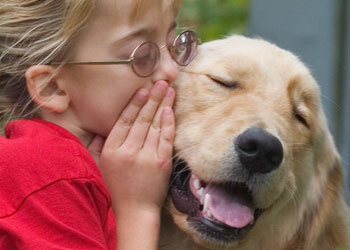 For more information about eligibility and applications, visit metro.net. TAP is a fare payment system used by Metro and many other regional transit agencies. TAP is a durable plastic card with an electronic chip inside that you can use again and again. You can load your TAP card at TAP vending machines at all Metro Rail and Metro Orange Line stations, Metro Customer Centers, and approximately 400 pass sales outlets. For additional information about Metro’s Reduced Fare Program, visit metro.net; for more information about TAP, visit taptogo.net. As the first ever National Ambassador Family, the Rossiters are truly honored to represent Abilities Expo across the nation. Ten-year-old Ainsley is an amazing young girl living with INAD, an extremely rare, terminal, progressive disorder of the nervous system. 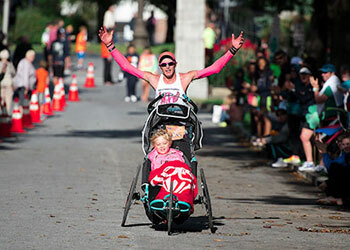 Years ago, Ainsley participated in a marathon where her father, U.S. Marine Major Kim "Rooster" Rossiter, pushed her in her stroller. 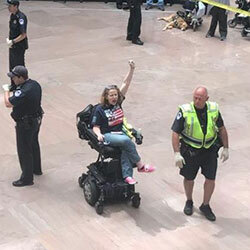 Ainsley's elation over the experience was the inspiration for Ainsley's Angels of America, an organization which helps people with disabilities participate in long distance events as a team.